Packing a lunch for work is a smart choice that can save you plenty of money, not to mention calories. So why do so many of us skip the brown bag lunch, in favor of the food court or office cafeteria? If you've always thought of brown bag lunch as just a sandwich or plain salad, we're here to inspire you to think outside the lunch box with creative, packed-lunch recipe ideas, that are not only healthier than the typical lunch counter options, but super-charged with awesome flavors and textures, too. Check out our round-up of healthy, flavorful lunch recipes that will transform your everyday office lunch. This recipe takes the classic Caprese sandwich, which is already pretty healthy, and super-charges it with vitamin-packed arugula and calcium-rich fresh mozzarella cheese, plus anti-oxidant rich tomatoes. 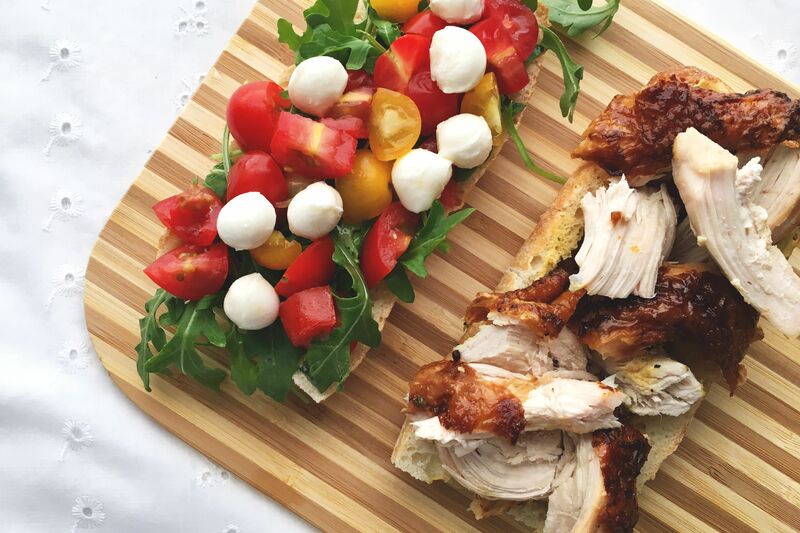 Add some rotisserie chicken for protein and replace the usual olive oil with flavorful truffle mustard and white balsamic glaze, and you've got a delicious, filling sandwich recipe that checks all the boxes for a healthful and satisfying brown bag lunch. Are you trying to avoid fried foods at lunch? Here's a great way to enjoy the taste of a popular take-out favorite, without the fat and calories associated with frying. Tasty baked falafel is a healthier take on the Middle Eastern classic, made with protein-rich chickpeas, which are an excellent source of fill-you-up dietary fiber. Pack baked falafel for lunch wrapped in a pita sandwich, along with some heart-healthy hummus, shredded lettuce, and other veggies for a filling, hand-held meal. Enjoy the tastes of the Mediterranean when you pack this flavor-packed, healthful pasta salad recipe for lunch. Enjoyable either hot or cold, this satisfying, yummy pasta salad recipe is suitable for vegetarian diets and quick and easy to prepare. White beans and feta cheese add protein, while artichoke hearts deliver salty flavor and chopped vegetables deliver crunch. Make it with whole wheat pasta to make it even more nutritious. 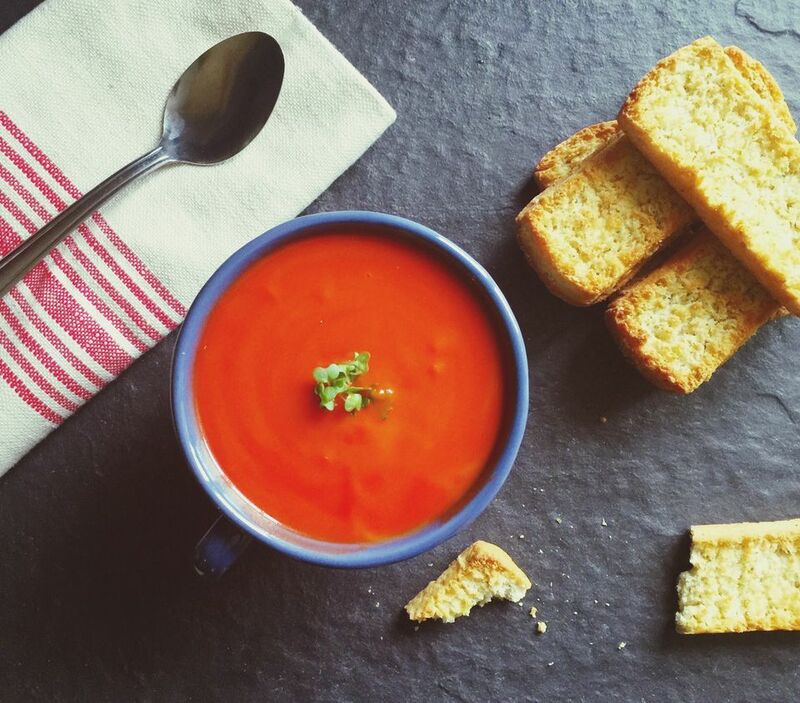 This super-healthy tomato soup recipe tastes so rich and hearty, you won't believe there's no cream added. Sweet, fresh tomatoes are simmered with diced onions, garlic and chicken broth before being pureed into a smooth and creamy soup. A simple roux of flour and butter adds satisfying thickness with just a dash of balsamic vinegar for a tangy kick. Bring it to work in a thermos to enjoy with some crusty baguette, cornbread or crackers or with a side salad. This fresh take on Thai spring rolls–also known as salad rolls–are a fun change of pace from your usual workday lunch. They're simply full of healthy fresh vegetables, including asparagus, snap peas, radishes, bean sprouts and tender lettuces. Easy to prepare (it's all in the chopping), you can enjoy these delicious rolls for a vegetarian lunch. Or, add slices of baked tofu, shredded roast chicken, or poached shrimp for protein and extra bite. If you love a burrito (and who doesn't? ), try making this easy, nourishing vegan bean and rice burrito for your next office lunch. Vegetarian bean burritos are filled with leftover rice, plenty of Mexican spices and all your favorite burrito toppings for a filling and tasty lunchtime meal. It's sure to become one of your favorite healthy recipes. Trendy rice bowls are often as attractive as they are nutritious, and this spinach pesto rice bowl recipe is no exception. Fresh spinach comes together with crunchy toasted walnuts, lemon and garlic to make a super fresh-tasting pesto before combining forces with tender brown rice. The flavorful mixture is topped with crunchy and bitter radicchio, salty feta cheese, creamy avocado and a soft boiled egg for a picture-perfect lunch that your co-workers are sure to envy. This yummy, nutrient-rich lentil dish is easy to prepare and makes a satisfying meat-free meal. Sweet potatoes are an excellent source of vitamins, potassium and dietary fiber, while lentils deliver the protein and iron that's so important to vegetarian diets. Meanwhile, meat-lovers can amp up this stew-like recipe, by adding cooked ham or bacon. Skip the food court take-out lines and prepare this homemade, low-carb Pad Thai salad recipe that makes a great workday lunch. Featuring bold Thai flavors and an abundance of textures, this healthier version of the classic Pad Thai Noodle dish is absolutely delicious, while also being light in calories and fat, plus naturally gluten-free. It's also (surprise) low in carbs, thanks to the use of rice noodles instead of wheat. Canned tuna packed in water is naturally low in fat, high in protein and an excellent dietary source of calcium and magnesium. Enjoy this tasty version of the typical tuna salad sandwich that's punched up by chopped fresh peppers, green onion, Dijon mustard and shredded Parmesan cheese. The Nicoise salad is a French bistro classic that makes an elegant lunch. You deserve to dine on this delicious, thoughtfully composed salad featuring protein-packed tuna, filling potatoes, hard boiled eggs, briny olives and crunchy green beans, all drizzled with a simple homemade vinaigrette dressing. Yummy cashews add plenty of health benefits to this easy to make, vegetarian fried rice recipe that's a healthy lunch option when you're craving Chinese food. Leftover rice is tossed with vegetables, cashews, ginger and soy sauce for a homemade fried rice experience that delivers on nutrition and satisfaction, and lets you skip the take-out line. Looking for a way to make your brown bag lunch more exciting? Try this tasty French-style sandwich with rosemary ham, creamy goat cheese, peppery arugula, apple, honey, and lemon. Sweet, salty, spicy and crunchy, this sandwich packs plenty of protein and flavor and makes the perfect lunchtime meal. Vegetarians can skip the ham and add more apple slices and goat cheese. Or, try adding roasted vegetables for a burst of extra flavor. When a boring salad won't do for lunch, kick things up a notch with this fresh-tasting, protein-packed, lower-fat lunchtime salad that's full of flavor and color. Black beans and mangos combine with fresh bell pepper, jalapeno and cilantro in this simple recipe that's suitable for vegetarian, vegan and gluten-free diets. This robust and tasty curry chicken salad sandwich recipe packs a huge amount of flavor, with more health benefits and fewer calories than your typical chicken salad. Leftover chicken is mixed together with cashews, cranberries, mint, green onion and cilantro, then blasted with flavor from a curry spice, turmeric, ginger, honey, sriracha and lime juice dressing. Greek yogurt is also mixed with the mayonnaise in this recipe, providing a nice, tangy bite and adding probiotics and live cultures that help aid digestion and speed up metabolism. Do you like pasta? Add this vegetarian-friendly lemon pine nut pasta recipe to your shortlist of quick and easy pasta dishes that you can toss into a container and enjoy for a filling, nutritious lunch. Thin pasta noodles are cooked and tossed with a little olive oil, lemon, garlic, pine nuts and lightly steamed broccoli for a guilt-free weekday lunch. Thai basil chicken lettuce wraps make a crunchy-delicious lunch that's brimming with taste and fun to eat. Quick and easy to prepare too, you can top these chicken and stir-fry veggie filled wraps with chopped cashews and peanuts for extra protein and crunch, before chowing down. This fresh, filling and vegan lunch is packed full of veggies and vegan cream cheese and is rolled up in tasty flour tortillas. It is the perfect mess-free and healthy lunch! When you're craving Chinese takeaway for lunch, why not try this healthier homemade version instead? Chewy, nutritious egg noodles are stir-fried with sweet shrimp, chopped veggies, ginger, prepared sauce and a little bit of sesame oil to create a lunchtime meal that's absolutely packed with flavor.